There was only one moment during my research that I wondered if I shouldn’t rather keep my job, do more night shifts and keep safe. It was when I researched the Salar de Uyuni. At first, it sounded exciting. 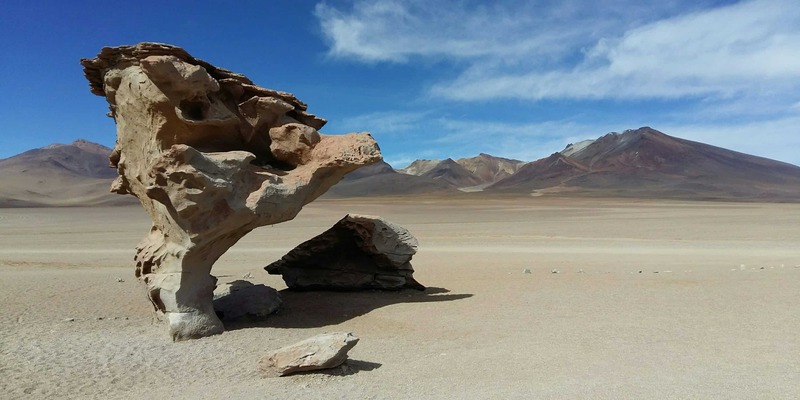 I knew I wanted to see the Atacama desert and when I read that you could do a three day tour from San Pedro de Atacama to Uyuni, my first thought was that I wanted to do it. Then, I opened my guidebook that warned about drunk drivers, freezing cold nights and one out of five people declaring this trip a never-ending nightmare. I thought that maybe the author had had a bad day when writing that chapter and started my research online. The very first blog post I opened was about how the Bolivian driver was so drunk on the second day, the tourists just loaded him into the trunk of the jeep and drove themselves. That was when I decided to stop all research. I wanted to see the Salar de Uyuni, so I would have to cross the border and do the trip. There was no use in reading up on dangers until I would be too afraid to go. 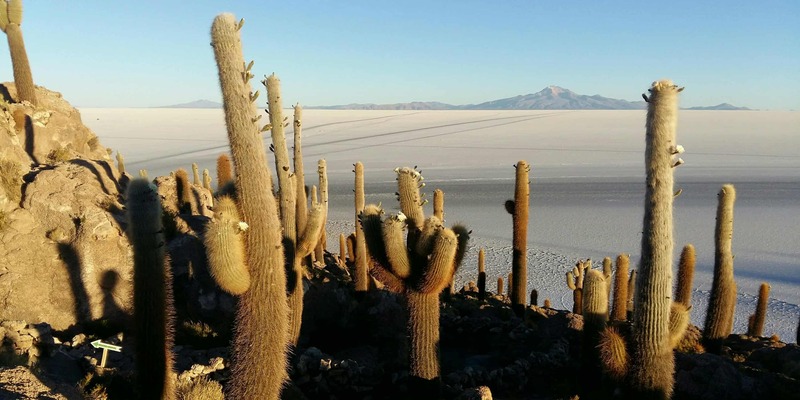 And now that I’m sitting on my bed in our hotel in Uyuni, I am very glad that we went. The trip was amazing, definitely one of the highlights of my whole journey through South America. We started early in San Pedro de Atacama, spending an hour queueing at the Immigration office. This time, I got an exit stamp from Chile. Last time I had been in the country, I hadn’t. Not that anyone had cared so far. 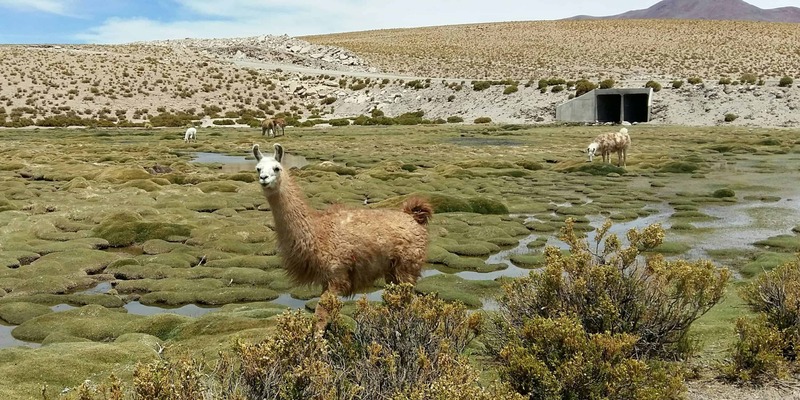 But the good news is that if you do this trip, you will be accompanied by a Chilean guide who will make sure you complete all the paperwork you need. After finishing in San Pedro de Atacama, we went straight up to the Bolivian border. And when I say up, I mean it. We went from 2300m to 4800m in less than an hour. Fortunately, we had already spent a couple of days in San Pedro and had gone up to 4300m on day trips a couple of times. 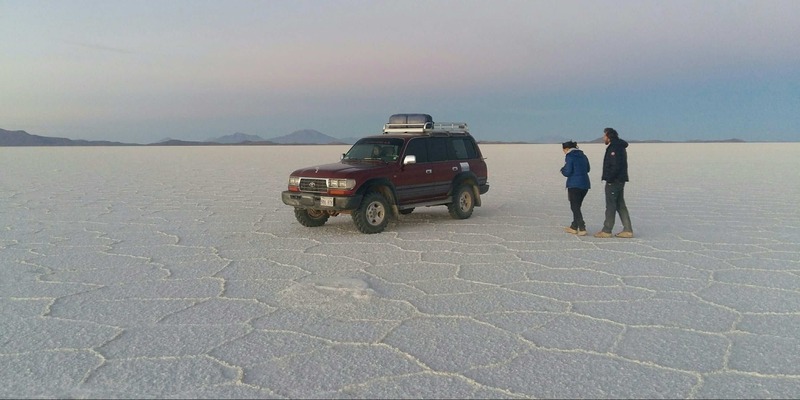 If you are coming from sea level, do not go directly to Uyuni. Instead of enjoying the trip, you will spend it feeling like your skull is going to split open. Not to mention that altitude-sickness can be seriously dangerous. After having breakfast at the Bolivian border and completing all formalities there, we transfered our luggage to jeeps. A jeep can hold a maximum of six people. The luggage goes on top, so you will need to pack a day-pack with everything that you need. For the first day, that includes a bathing suit and a towel. We were lucky and were only four in the jeep, a couple from French Guyana, my friend and me. Plus our driver, Efraím, who replied with, “perfecto” when we told him that we spoke un pocito Spanish. In retrospect, I think that Efraím spoke far more English than we spoke Spanish. But he took a lot of pleasure in giving us explanations in his mother language, repeating things slowly over and over again until we finally understood. I learned a lot of Spanish words from him during those three days and can now have conversations about every single mineral you can find in the Andes and altitude-related headaches. While tours generally do not include English-speaking guides and drivers, most of them seemed to speak at least a few basic words. And if you really do not speak any Spanish at all and are worried, be assured that there will be someone in your jeep who will understand basic Spanish and can translate for you. Having introduced ourselves to Efraím, we started driving north. The first day took us past a couple of lagoons. I won’t bore you with their names, I’ll just tell you that each and every single one was stunningly beautiful. The farther we got along, the more flamingos we saw, until we finally reached the red-coloured Laguna Colorada at lunch-time. Thousands of flamingos live in this lagoon, their pink bodies a great contrast to the dark-red water, the multi-coloured mountains and the blue skies above. 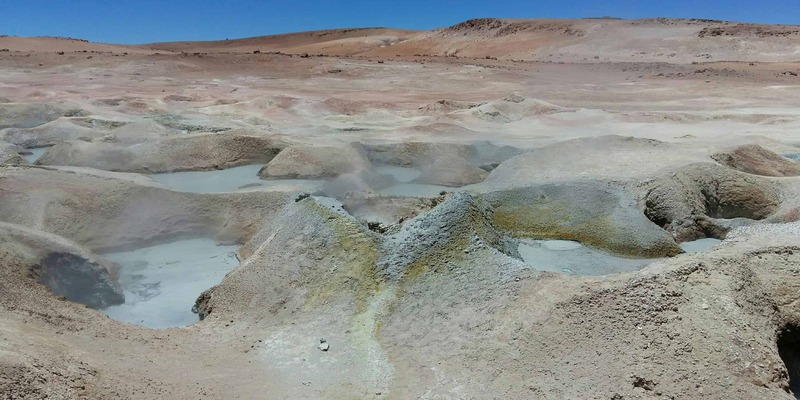 Besides lagoons and flamingos, we came past herds of vigunas, crossed surreal-looking desert landscapes and stopped at geysers and bubbling mud-pools. At an altitude of more than 4900 meters, the smell of rotten eggs made me feel dizzy, as if my head was wrapped in cotton. I was still well off, compared to my friend who almost passed out. It must be a common problem because Efraím told us that we couldn’t stay longer than ten minutes so we wouldn’t breathe in too many of those toxic gases. That night, we stayed in a refugio close to the Laguna Colorada. We shared a room between the four of us. Knowing that nights up here would be cold, we instantly grabbed the blankets from the two remaining beds and shared them between us. I ended up with four heavy blankets and two lighter bed covers, which was more than enough for the night. In fact, it was so much that I felt like I was getting crushed by the heavy blankets. I did this trip at the end of November. If you’re coming in winter, ask your travel agency about the possibility of renting a sleeping bag in addition to the blankets. Winters are freezing cold at this altitude and the refugios do not have heating. You could also buy blankets in San Pedro de Atacama. In fact, if you do not have any proper winter clothes, I highly recommend you buy warm clothes before leaving on this trip. They are not expensive, and they make your life so much better. In November, I was wearing a woolen llama jacket over my fleece jacket, plus a scarf, hat and gloves and I was fine in even the coldest places. In July, you’re going to need far more clothes than that. Hot showers, by the way, are available for a fee and are a great way of warming up after a cold day. The second day, we went further north, always driving parallel to the Chilean border. We saw more volcanoes, deserts, strange rock formations, vigunas and, of course, more lagoons with more flamingos. No matter how many of those pink-coloured birds I’ve already seen, I’ll never get tired of watching them. They are incredibly funny, especially when searching for food. That afternoon, we saw first traces of people living permanently in the area. We came across a tiny village and shepherds with their llamas, before stopping in the village of San Juan for the night. This time, we stayed in a salt hotel. The walls really were made of giant blocks of salt – I tasted them. It was warmer than the previous night and I slept very well, until my alarm woke me up at four in the morning. We drove straight from the salt hotel to the Salar de Uyuni. The sky was slowly getting light as we drove through the salt desert. We eventually stopped and got out. Everything was quiet, except for the salt crunching underneath our feet. A white landscape stretched out until the horizon. The sky behind us turned pink as the sun rose. It was one of the most magical moments of this trip. After sunrise, we visited Isla Incahuasi, an island overgrown with cacti in the middle of the desert. 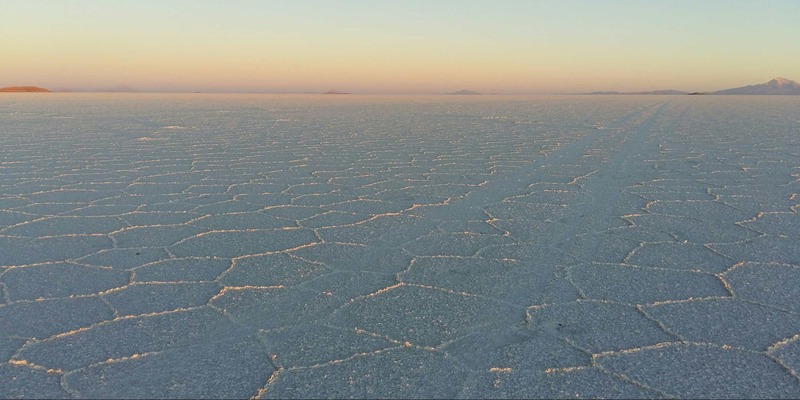 We had breakfast in the parking lot and then drove out into the salar, until the white stretched out to the horizon. It was here that we started taking the famous Salar de Uyuni pictures, playing with perspective and the two accessories we had brought along – sprite bottles and an empty can of Pringles. Our guide brought out two plastic dinosaurs and we had a lot of fun taking pictures in the desert. Our last stop was the Cementerio de los Trenes, a graveyard of old trains that was once used to transport minerals from the mines onward into the big cities. We climbed the rusty trains, took a couple of pictures and then finished with lunch in Uyuni. If we had wanted, we could have gotten an onward connection to Potosí or La Paz on the same day. We prefered to stay in Uyuni and recover from the early morning start, leaving the town on the next day. That afternoon, we bought some souvenirs and mostly relaxed, looking through our photos and laughing at the ones from the Salar de Uyuni. It was an amazing trip and I’m glad I went. We hadn’t had any trouble at all. The accommodations are basic, but they were clean and I was warm enough during both nights. Our driver was amazing, keeping us safe on those unpaved roads and making sure we got the most out of our experience. The company I went with is called Cordillera Traveller. 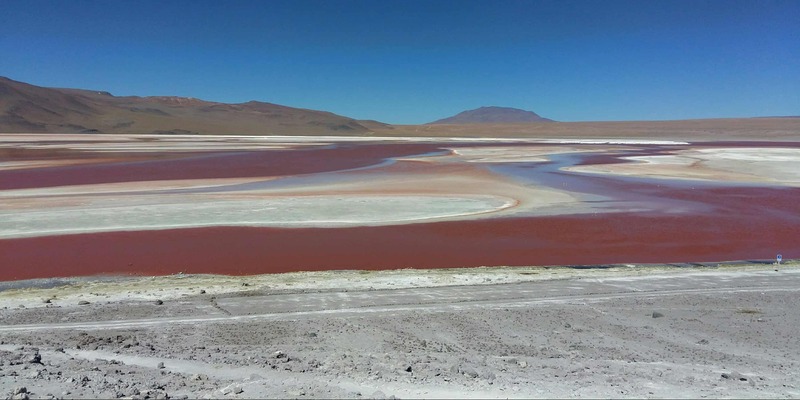 They have offices in both Uyuni and San Pedro de Atacama and I can highly recommend them if you’re planning on doing this trip yourself. 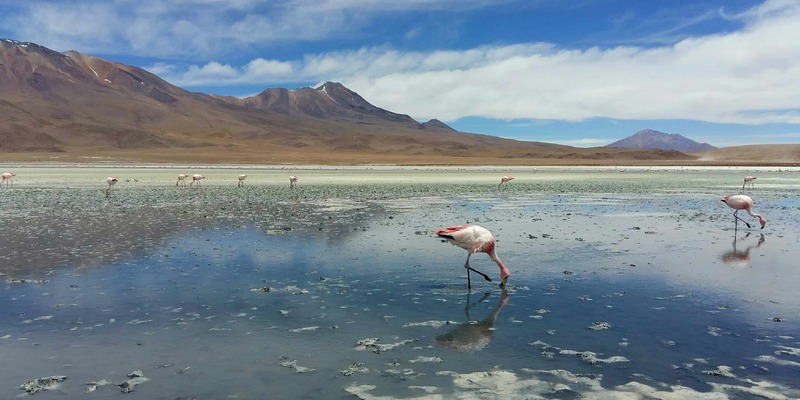 Don’t let any bad reports scare you off because you will be rewarded with stunning scenery, thousands of flamingos and, of course, the salt flats. Wow! This is such a lovely post. I’ve never heard of Salar de Uyuni before but it looks like a beautiful place with all those volcanos, lagoons and deserts. Those flamingos look beautiful. The view of the sunrise is heavenly! Graveyard of the trains sounds interesting. It’s great they offer hot showers – quite a bliss in such a cold weather. It is a very beautiful place, which is why I decided to write about it. Thanks for your comment, I’m glad you like the post! You should tell stories more often, I loved reading this blog post! I always do it just like you: I want to see with my eyes if it’s true, in stead than just reading the bad press. More often than not I’ve noticed that the authors are biased! Yes! I have been to a few places that were described as horrible in guidebooks and that I enjoyed. And I’m very glad I didn’t rely on what I found online because it would have been a shame to miss out on this experience. This was a very interesting and informative read, my first about this area. I agree with other readers you should write more stories about your travels, especially to places like this where many people do not venture to. Thank you very much! I have decided to definitely write more travel stories. I’m already brainstorming ideas for the next one I can write.